At Chr. 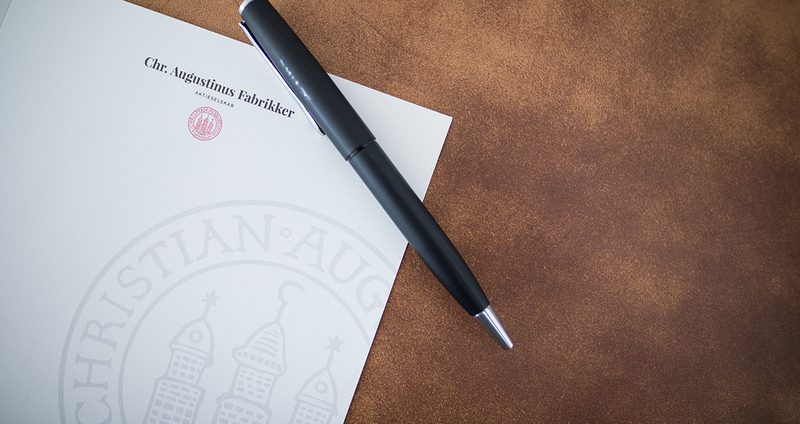 Augustinus Fabrikker we strive to be the ideal owner of successful Danish businesses. We gradually expand our activities by making new types of strategic investments, thus ensuring that the risk is balanced and at the same time creating opportunities for generating returns. It is a precondition for our ownership that our fundamental requirements are fulfilled: sound and solid business models, strong management, and returns matching the investment risk. The optimal ownership structure for any enterprise, is determined by the actual situation, at any time, and potential something that changes over time. We see ourselves as owners in more contexts. We act as direct owners of Danish businesses as well as owners of listed companies, and our ownership includes both controlling positions, minorities as well as other types of partnerships. When partnering with private equity funds and other owners, we are active as co-investors, pre-IPO investors and as anchor investors in IPOs. As the ideal ownership structure may change over time, we remain flexible in case the company is better served with a change in ownership. Chr. Augustinus Fabrikker’s financial investments are managed by our own teams as well as by external partners. Our financial investment strategy covers a number of asset classes where we deploy an active Asset Allocation strategy. Chr. Augustinus Fabrikker allocates a significant portion of the balance to financial assets. We believe in active asset management, and in markets where our own teams have expertise we cover the investment selection ourselves. In other markets we have built close partnerships with professional and carefully selected asset managers. Our financial investments span across various asset classes, and we take a dynamic approach to Asset Allocation. Social Impact investments form a natural part of Chr. Augustinus Fabrikker’s strategy. We believe that our ambition to generate returns is compatible with actively investing in sustainable development. We have teamed up with professional asset managers with the experience and knowhow required within impact strategies. Our current focus is on micro-finance, buyout strategies and development of infrastructure, and includes both environmental, social and governance aspects. We work with a few carefully selected external asset managers who focus on Social Impact strategies. For many years, Chr. Augustinus Fabrikker has been a successful owner of Danish businesses. Long-term ownership has given us the experience to facilitate the execution of an optimal strategy. We are dedicated owners, but greatly respect the fact that ownership and day-to-day management are two different disciplines. Through close dialogue and commitment, we strengthen not only our own investments, but also the Danish business community.